Helping you provide unprecedented care to your patients with behavioral health conditions. 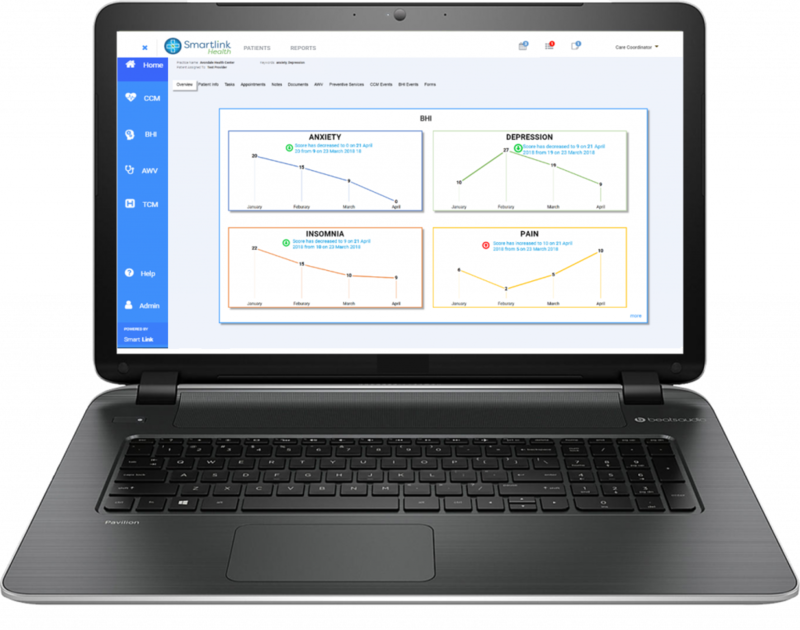 Improve both behavioral and medical outcomes while increasing your revenue. Medicare is closing the gap between medical and behavioral conditions with its new General BHI fee-for-service (FFS) code, CPT 99484 (previously G0507 in 2017). Physicians can now get paid for monthly non-face-to-face contact with their patients who have at least one psychiatric diagnosis, including substance abuse. Our BHI solution provides physicians with the perfect way to proactively care for their behavioral health patients while creating a new revenue stream for their practice. Use your team or ours, either way, our evidence-based, guided patient dialogue and validated rating scales will drive meaningful conversations, track and monitor symptoms over time and alert you to early warning signs that require intervention. You, your staff and, most importantly, your patient can prevent the need for emotionally and financially costly acute stabilization services. Guided patient dialogue with built-in validated rating scales covering the following conditions: Depression, Anxiety, Insomnia, and Pain. Trend analysis of rating scales to determine how the patient is doing over time. Response-based action triggers to alert physician of early warning signs that require intervention. Proven onboarding workflow that optimizes patient enrollment, maximizes provider billings, and provides the value needed to keep patients in the program. Position your practice or ACO as a leader in the behavioral health integration movement. We have the software, people, and a defined process to ensure both you and your patients get the most value possible from your BHI program. Use your people or ours. Either way, our defined workflow process will help ensure your ongoing BHI success. Contact us at 877-502-3067, info@smartlinkhealth.com or simply click the Chat button below. We’d love to learn more about your team and how we can help your General Behavioral Health Integration initiative.